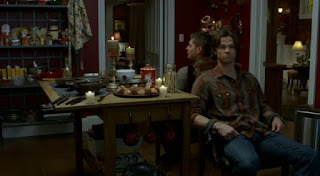 S3E8 "A Very Supernatural Christmas"
It's christmas and Santa is killing people, bad santa. of beings who were around long before the rise of Christianity. A local bookclub aka coven goes awry when the goings on of the local neighbourhood folk cause distress and distrust but is it all part of a bigger plan? Quite bloody and gruesome but a weak episode although lots of pretty women such as Marisa Ramirez. S3E10 "Dream a Little Dream of Me"
Fun and hi-jinks when the boys investigate the "mystery spot" attraction and it's Groundhog Day once again. Lots of fun and that's needed for what is to come. target for the Demons out there which includes Peter DeLuise (SG1 writer/producer/director/actor). As the building is under siege only the most drastic action will save the souls trapped inside because someone is coming to finally take care of the competition. Brilliant episode. Ed and Harry are back selling their new fly on the wall reality show which includes Sam and Dean.